Click here to download engineered drawings. Why do I want to go solar? How do I get it for my house? Solar hot water systems are environmentally friendly and can now be installed on your roof to blend with the architecture of your house. More than 1.5 million homes and businesses in the United States have invested in solar heating systems, and surveys indicate that over 94% of these customers consider the systems a good investment. OG-300 Certified by the SRCC - Solar Rating and Certification Corp.
Our rating was the highest of any of the freeze-protected solar hot water systems using less than 95 square feet of collector area. Our systems used just 2 solar heating panels or 64 square feet of collector area. 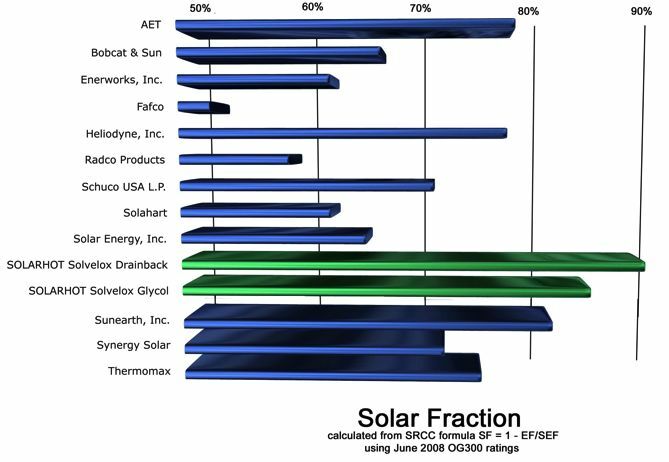 The SEF rating given to the SolVelox translated to a solar fraction of 86%! The key to this system is the SolVelox - SOLARHOT's pre-packaged, integrated solar thermal core - designed for maximum efficiency and minimum installation time. Click here for more information about the SolVelox.